Waves that move outwards from their source are called progressive (travelling) waves. The two types of progressive wave are transverse and longitudinal. All mechanical waves travel through a medium and they include: sound waves (usually air), Water waves (surface of water) and Earthquake Seismic waves (travel on and through the earth). The direction of wave propogation is at 90° to the motion. The direction of travel for transverse waves is: a) energy pushes particle in one direction depending on if the force is applied up or down.b) The particle then moves back to the centre. c) The particle goes in the opposite direction to where it went the first time. d) Finally, the particle returns to the centre. Longitudinal waves work the same as transvers except it moves left and right as opposed to up and down. 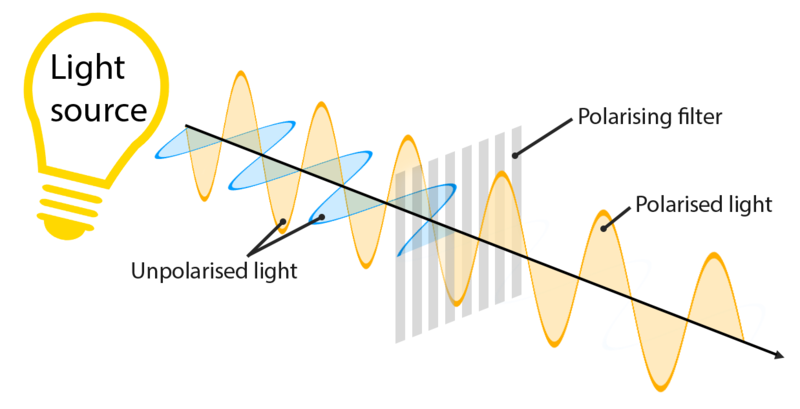 Transverse waves are plane-polarised if the vibrations stay in one plane only. If the vibrations change from one olane to another, the waves are unpolarised. Longitudinal waves can not be polarised. Used by photographers to alter the appearance of the sky.